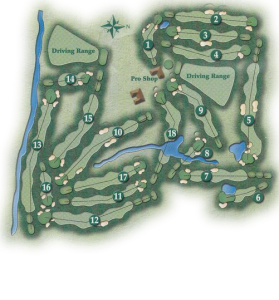 18 hole par 72 Perry Maxwell designed scenic golf course on 260 acres with 724 trees in play and 58 sand bunkers. 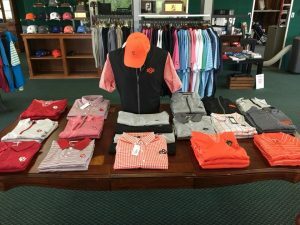 We are the host to the longest running Pro-am in the U.S., the Cherokee strip golf classic. Our facilities include a driving range, putting green,and pitching green,and indoor practice/teaching facility. Book your tee time today and experience the exhilaration of the Ponca City Country Club. Hole 1 is a Par 4 measuring only 274 yards from the back tees. But don’t be fooled, the shortest par 4 on the course can make for a rough start to your round. An accurate tee shot to avoid the bunker and the water hazard on the right is a must. Hole 2 is our number 1 handicap hole and requires you to be in the fairway. There is out of bounds to the left and trees to the right. This hole plays uphill and into the prevailing wind. The fairway slopes from right to left and there is a large fairway bunker up the left side, hidden from the tee box. Your second shot must be accurate to a tough sloping green. Hole 3 is a slight dogleg to the right. One fairway bunker is located on the left side and a large tree on the right. You must fit your tee shot between these in order to have a great shot at birdie. The green is a three tiered green sloping away,and is protected by two bunkers. Hole 4 is a dogleg left and requires a right to left shot from the tee. You have many options off the tee box from driver to hybrid. The second shot is uphill to a demanding two tiered green. The first of four Par 5’s you will come across and the only par 5 on the front 9. A well placed tee shot will give you access to the green. Several bunkers are in play to make any layup challenging. Our 6th hole is a great short Par 3.water and bunker are to the right side. The back half of the green is sloped away from incoming tee shots. Club selection is crucial on our 7th hole. There are many different options off the tee. Out of bounds to the left and hazards on the right. A tee ball must be in the fairway here. The green is very challenging with multi levels. The second shot must be very accurate in order to move on with a good score. A tougher Par 3 here. An uphill tee shot with a bunker and grass bunkers short and right. A large green with a lot of slope awaits. A difficult Par 4 measuring 440 yards from the back tees is our longest par 4. This par 4 has a generous fairway but also has trouble with a lateral hazard to the left and trees to the right. The second shot is uphill and plays a club longer. A bunker short left and middle right helps to protect the green. Our shortest Par 5 to start your back 9. The first of 3 Par 5’s in the next 4 holes. This hole is best played up the right side avoiding the fairway bunker. This will give you the best angle into this green that is protected by several bunkers. Don’t let the length of this hole take your attention away. Although short in length, our 11th hole will challenge you on and around the green. The tee shot is generous and is best played by moving the ball right to left. The green is one of the more challenging greens with a lot of slope. The second Par 5 on the back nine demands an accurate tee shot and is best played by moving the ball left to right. Trouble is all around with trees on the right side and hazards on the left. A difficult fairway to hit. the second and third shots from the from the fairway will give you a great opportunity for a great score. Our longest hole at Ponca City Country Club. This hole is flat and requires a lengthy tee shot and second shot. A lateral hazard protects the entire left side. The green is one of the flattest and can give you the opportunity for birdie. An uphill Par 3 protected by trees to the left and a bunker short and to the right. A two tiered green awaits an accurate tee shot. A great dogleg right par 4. Many players can shorten this hole by taking their tee shot over the right side trees. Others must play this hole from left to right. A second shot into the smallest green can provide a great score. A demanding Par 3 that plays slightly uphill. The green is protected by a front bunker and a back left bunker. A sloping green can make it difficult to make par. A straightaway Par 4. The fairway slopes slightly from right to left. The green is the hardest green to navigate. Several slopes and a false front will make this par 4 difficult. A great finishing hole to our beautiful golf course. This hole plays uphill and requires once again, an accurate tee shot. Out of bounds and trees to the left and hazard to the right. Your approach shot must be accurate into this three tiered green that sets at an angle.